When it comes to my closet – clothes just change location, never get truly “cleaned out”. Garments that aren’t being worn (or don’t fit) get heaped behind the sewing table – ready to have buttons/zippers/details removed to be reused. Or….waiting for inspiration to strike when they will be transformed into another style (hopefully, using up some of the many yards of fabric stockpiled in my house)! Just in case this teetering pile ever begins to dwindle, or if a shelf should strangely become vacant in my closet, I rush over to my friend’s house whenever she says her daughter is cleaning out her closet. On a recent trip, I got two tops, a dress, some pants, and a long cardigan. 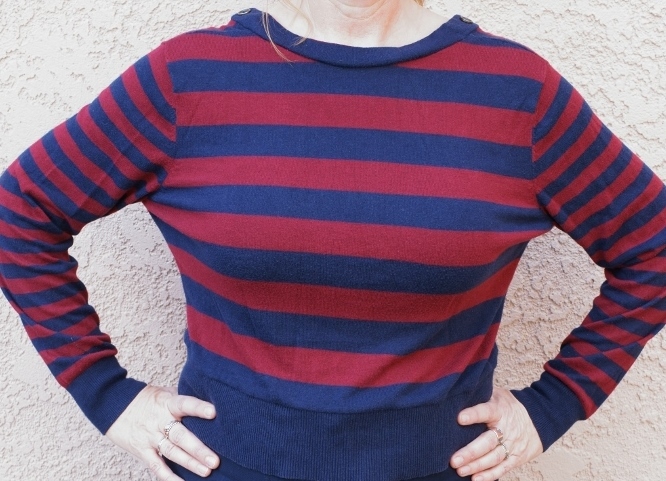 I love horizontal stripes, even though they’re not the most flattering for my body, but, oh well……. 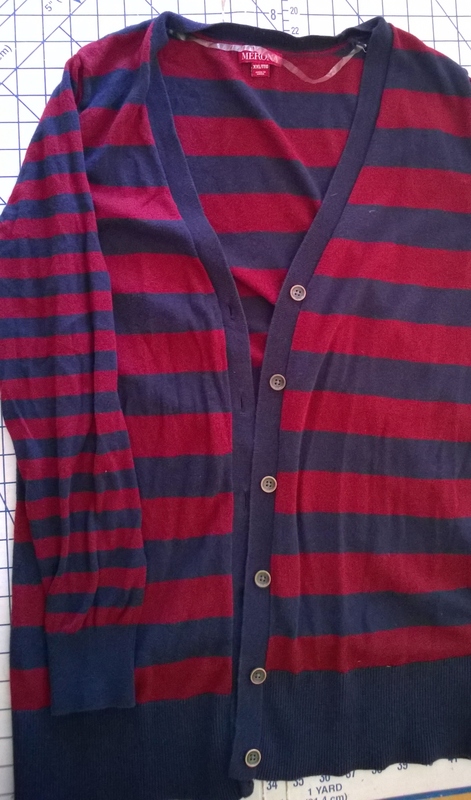 So, naturally, the item that jumped out at me for the first restyle was a long red/navy striped cardigan. 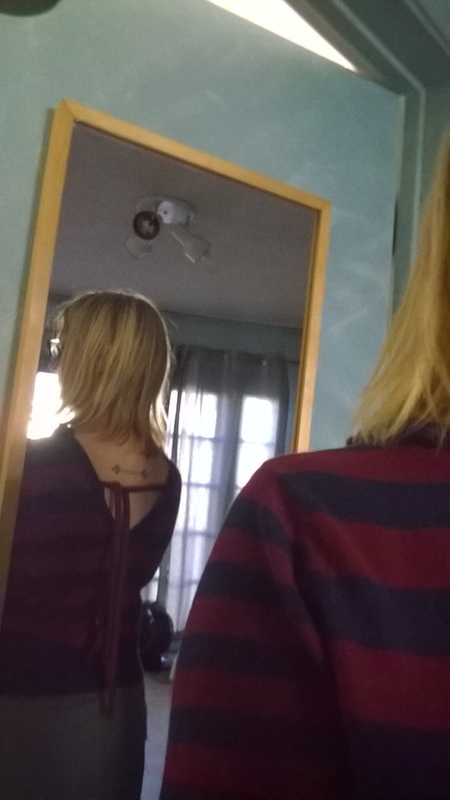 I tried it on, and stood staring into the mirror…..hmmmm….. Suddenly – I had a flash of inspiration (maybe it was the steaming hot coffee refill, or perhaps the jolt of Blink 182 in my headphones). I reversed the cardigan, wearing it backwards – something I often used to do with thrifted 50s cardigans in my college days. I cut the rib edge off when I lowered the neckline. A more open neckline meant the original edging was too short, so I used a navy stripe from the chopped off body as a new neck trim. I also had to be a little creative at the shoulders, using some hand-stitching and buttons. 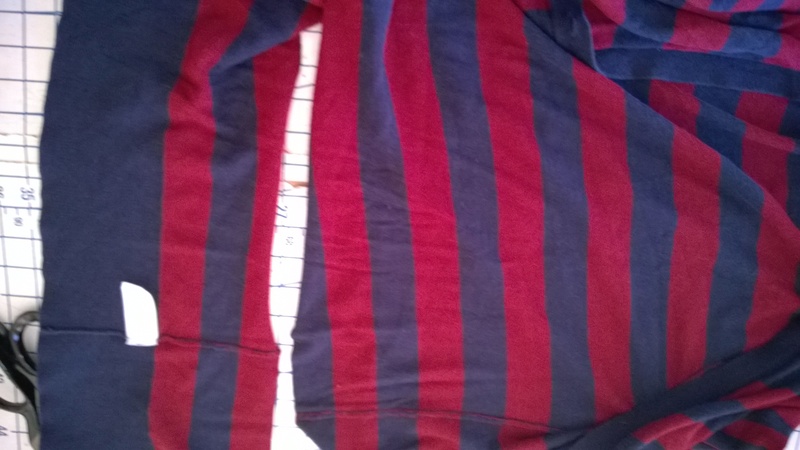 I reattached the original rib at the new shorter hem, and stitched up the back, leaving the (were plastic, now metal) buttons just as a detail, not functional. I used some of the spare fabric to make two thin ties for the V-back…..and done! 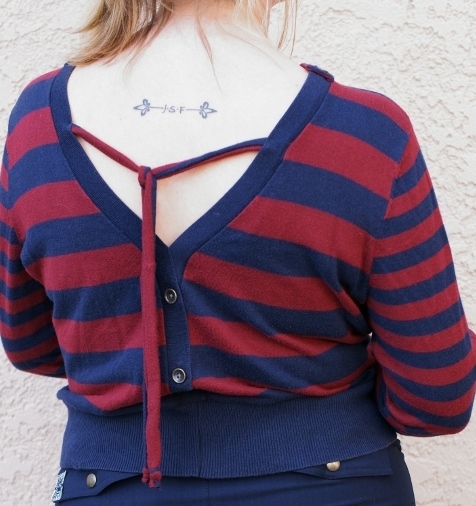 Posted in Uncategorized and tagged backwards cardigan, cardigan restyle. Bookmark the permalink.